In 1999, a number of young women go missing in the Perth suburb of Claremont. One body is discovered. Others are never seen again. Snowy Lane is hired as a private investigator but neither he nor the cops can find the serial killer. Sixteen years later, another case brings Snowy to Broome, where he teams up with Dan Clement and an incidental crime puts them back on the Claremont case. CLEAR TO THE HORIZON is a nail-biting Aussie-style thriller, based on one of the great unsolved crimes in Western Australia’s recent history. Back in the late 1970's Dave Warner released music that became part of the soundtrack of my life. When I discovered CITY OF LIGHT, MURDER IN THE FRAME, EXXXPRESSO and other books by him in the late 1990's / early 2000's I was more than a bit chuffed to think a musical hero was also a lover of crime fiction. And I bloody loved all of those books. CITY OF LIGHT was Dave Warner's first book (from memory), it won the 1996 West Australian Premier's Award for best fiction, and it introduced a young police constable, and aspiring footballer Snowy Lane. In this book Lane is investigating the murder of a number of young women by the serial killer dubbed 'Mr Gruesome'. 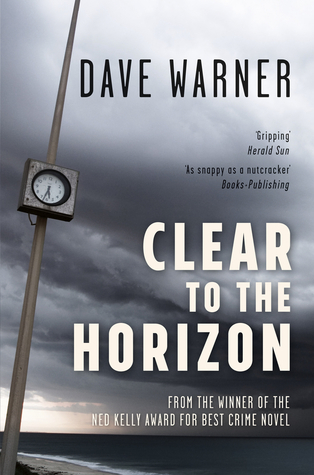 If, however, you've not read any of Dave Warner's work then CLEAR TO THE HORIZON is a great place to start, as would be BEFORE IT BREAKS which was a very worthy Ned Kelly winner indeed. CLEAR TO THE HORIZON is told in two later periods of time, basing itself around the true story of a number of young women who were killed by an undiscovered serial killer in Claremont, Perth. When the novel starts out in 1999, a number of young women have gone missing, with one body discovered, and the others never seen again. Snowy Lane is hired by the parents of one of the missing girls, but he, and the police, are never able to find the girls or the killer. Moving forward 16 years, Lane finds himself on an unconnected case in Broome (this time teaming up with Dan Clement from BEFORE IT BREAKS), and an incidental event takes him straight back to the Claremont investigation. All of which probably sounds a little complicated, but if you've not read either of the earlier books it won't matter a bit. Nor will it matter if you're not across the details of the true cases on which a lot of the narrative is based. 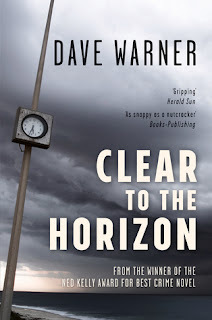 If there's one thing that Dave Warner excels at it's weaving yarns, and CLEAR TO THE HORIZON is a great yarn, with fully fleshed out characters, and plenty of action and pace. Snowy Lane is an easy bloke to like. Dedicated to his job, he's also a loving family man with a very normal sort of a life. The Claremont case haunts him, but it hasn't twisted him. He's not one to forget, but he's also not one for dwelling. Having said that, give this man a hint of a possible solution and he's not easily distracted. He's very real, and there's more than enough back story dotted throughout this novel to give you an idea for where he's coming from. There's also a terrific sense of place in Warner's novels. In this case the heat and light of beach-side Fremantle and Broome are clear and bright, contrasting well with the night-time pubs, clubs, alleyways, taxi ranks and parking lots where the young women disappeared. It's worth remembering that apart from the general details of the true crime around which the novel is based, everything here is fictional - much of it is so real, and so feasible in terms of possible suspects, and the final resolution. I confess to having been a mad fan of Dave Warner's music. It makes me very happy that the stories he tells in his books are longer in form, but still so clearly about life as it happens in Australia. It's particularly fortunate that there's no need to a lot of dancing when a new book comes out - my knees aren't what they used to be back in my punk days. But happy dancing of a slightly more sedate version still goes on.